Secret World Legends is a reboot in the sense that the second verse to a song is a reboot to the first. Functionally it follows the same ebb and flow, but it feels like somewhere along the way the lead singer/manager died, only to be replaced by the studio label’s brand manager who doesn’t so much care about playing sick tunes at the next small gig as he does monetizing the band to death. The end result reminds me a lot of City of Steam, a fun game that didn’t do so well in revenue and as such was resurrected as a shambling money zombie to the detriment of the community and ultimately the game’s viability as people left for greener pastures. After heavily considering whether I want to review a game that is now several months old and rebooted from a five year old title, I guess you can already tell my answer. I’ll be the first to admit that my memories of The Secret World are as biased as they can get, owing to the 2012 launch and accompanying alternate reality games that were ridiculously cool. I can still remember sitting at my computer with a few thousand people watching CCTV camera footage of a park in Montreal where one of the chat members met up with secret agents (actors) and was given the next piece of the puzzle as we all tried to crowdsource this intricate puzzle. Since the meat of Secret World Legends is pretty much on par with The Secret World, I think it’s safe to start with its two big draws; questing and the world. The secret world of the Secret World is one of myths, legends, and conspiracies. Imagine that everything you read on the internet is true, from living mummies in Egypt to vampires in Transylvania, swamp zombies in New England and filth in Tokyo. The Illuminati, the Dragon, and the Templars are very powerful entities unlike in the real world where contractual obligations require me to state that the Illuminati is certainly not controlling your everyday life via radio waves. You once again don the uniform of and join one of the three factions in their bid to stop the end of the world, mostly to forward their own purposes. Missions vary greatly in length and complexity, from the simple “kill x creatures” jobs to 29 tier journeys that can take more than an hour to complete. Because a lot of the puzzles involve knowledge of Morse code, bible scripture, and 18th century musicians, the game has helpfully built in a web browser to assist you in looking up the answers. As well as aiding in learning about the world in which you inhabit, missions also go far into establishing the plot and actors that you’ll be encountering along the way. I’m not lying about that knowledge of bible scripture by the by, a fair amount of puzzles early on will require you to source from the Good Book. One of my favorite parts of the story is in the scorched desert which features a series of quests that are basically stripped right out of an Indiana Jones movie. You even get to have a prolonged series of fights on a moving train. Many of the quests start and end with fully voiced cutscenes, and while the voice acting and animations aren’t always so great, it’s a nice change from the walls of quest text that still permeate most games in the medium. Combat is, and I know this is something of an unpopular opinion, better than the average traditional MMO, and I can give me sound reasoning. While combat does devolve into the usual MMO repetition of the same five buttons in specific orders, each fight tends to last just long enough that you don’t feel like you’re grinding out, and short enough that each trash mob doesn’t feel like busywork. 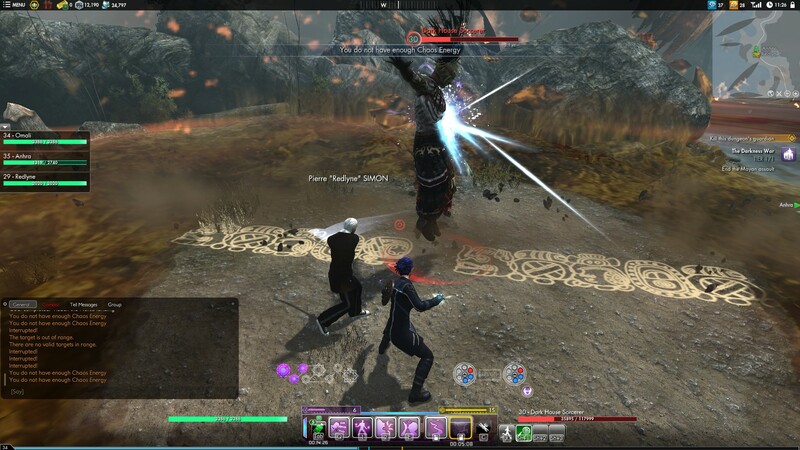 The game encourages you to keep moving by giving most enemies some form of powerful area-effecting attack, so Secret World Legends basically drip feeds you enough adrenaline to keep it from getting World of Warcraft quest-grind level boring. 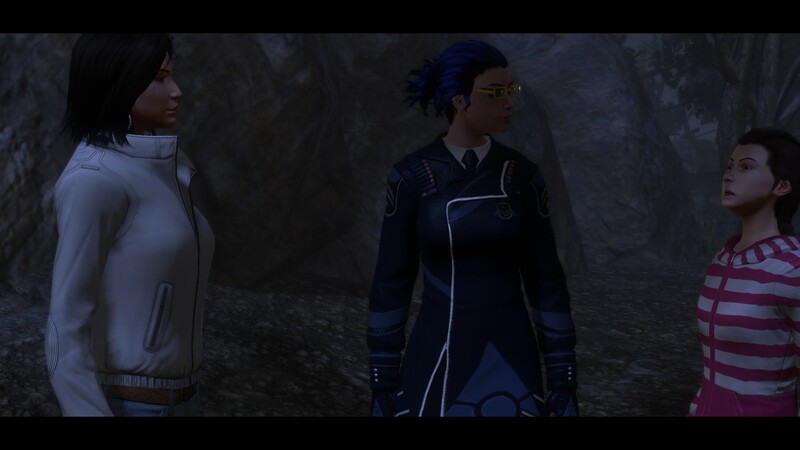 But now that I’ve talked about my two favorite parts of Secret World Legends, let’s get the rest of this over with. To further explain my point, I hit a spot while leveling where the story mode had become completely impossible to progress. 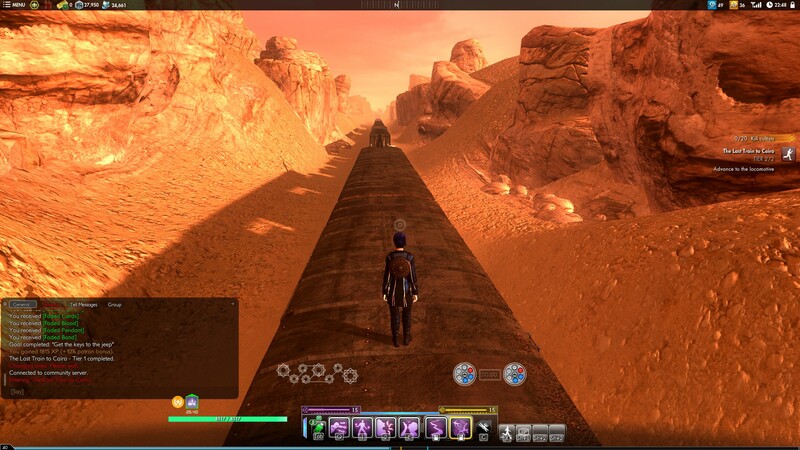 I leveled up my character and managed to reach the Scorched Desert, the first desert area. At one point, the main story tells you to complete a quest called “A Time to Every Purpose” for your contact Said before he will let you continue. Funny story, though: This mission is bugged and has been so since long before the relaunch in July. At one point in the mission, you have to craft two items in succession in order to progress, and sometimes the second just won’t craft. At all, for no reason. It also doesn’t help that this quest highlights some of the user interface chunks that are no longer functioning but remain in the game anyway. After reading through numerous conflicting theories on how to fix said glitch via Reddit and the official forums, I eventually found a method that worked for me. You craft the first item and then leave the area, log out, and come back which resets the quest but doesn’t remove the first item from your inventory. Get to the point where you craft the items and just craft the second item. Voila! Using a glitch to fix another glitch. Like the pyramids that dot the Egyptian landscape, many of these bugs are old and decrepit. The fact that many of these bugs have been in the game for months and still haven’t been fixed is depressing, the idea that some have been around on and off since the original launch is downright pathetic. It’s indicative of a company that is either grossly incompetent or pitifully understaffed, but considering that Funcom’s history of MMOs seems to be one unmitigated disaster of a launch after another (Anarchy Online and Age of Conan, followed by The Secret World and Lego Minifigures), I’m inclined to believe that the answer lies in both theories. The game just finished its Halloween event which is effectively just a reboot of an event from several years ago. The event had major, progression blocking bugs including one where a portal you had to step through to continue the quest just wouldn’t appear, for no reason. 3. R-E-C-Y-C-L-E Recycle! Make Gear Grinding Boring Again. Let’s talk about loot and gear progression in Secret World Legends, more specifically how underwhelming both aspects of the game are. It’s important that we talk about both in the same section as they specifically go hand in hand. Secret World Legends doesn’t much care about its loot, it knows that 9.9 times out of 10 you’re going to stick with what you have equipped and as such has no problem feeding you tons of junk with every completed mission. At the beginning of the game, you’ll pick your first primary and secondary weapons, a task that the game forces you to do before you even know what each weapon really does, and then locks the rest away behind some pretty aggressive currency grind. Rather than feed you a steady drip of increasingly fancy looking gear, Secret World Legends has you to level up your equipment by feeding it similar equipment, which are obtained via random bags given as rewards for completing missions. A mission might give you a weapon bag, a glyph bag, and a talisman bag, or some combination of the three. While I like the idea of being able to upgrade your gear, the manner in which Secret World Legends seems to rely almost entirely on feeding garbage into your weapons in order to slowly level them seems to cut entire swaths of content out of the game. It isn’t like, well every single other MMO where part of the reason to play is the hopes that you’ll get some cool piece of gear. It makes completing quests feel less rewarding, not to mention raids/dungeons, as your best bet at sweet loot is some junk that you’ll recycle to incrementally boost your existing gear. Get used to staring at the same weapon for most of your time playing, because especially after the first few levels there isn’t much of a reason to start leveling up a new weapon. So here you have an MMO with unsatisfying loot and virtually nonexistent gear progression. The more you level up and upgrade your gear to higher ranks, the longer it takes to get the pieces necessary to perform those upgrades. But hey, the cash shop is always there to speed that progression up, a sad reminder that certain elements of the game were functionally crippled in order for Funcom to try and make some extra moolah off of the free to play transition, at the expense of fun and, if it mimics The Secret World, long term financial stability and player loyalty. One thing you may have noticed is that I’ve been talking about loot gained through mission rewards, and I haven’t said much about loot gained through monster drops. This is simple, monsters don’t drop loot. 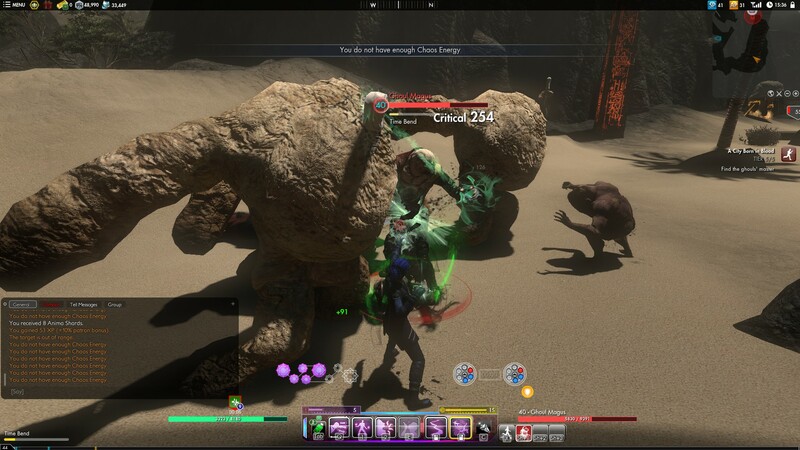 There are named boss creatures that roam around the map that will drop loot, usually just a random item bag, but monsters in Secret World Legends only drop one thing: Loot boxes. They drop a ton of loot boxes, and nothing else. According to the game, my character has 50 hours invested into it right now. In that time, I have managed to accumulate around 150 loot boxes. Now that translates to one box on average every 20 minutes, which doesn’t sound so bad and also doesn’t take into account the amount of time spent not killing anything. In reality when you’re killing mobs, these things drop every few minutes. This still wouldn’t be a problem, after all I play Neverwinter and that game drops loot boxes like candy, but that’s coupled with the fact that mobs drop nothing else. Literally the only loot that drops from standard level mobs needs to be unlocked with real money. It also doesn’t help that the loot box drops are nearly completely worthless. Barring the very rare cosmetic item, of which I have yet to obtain a single one from my daily patron keys, the loot boxes drop distillates and pretty much nothing else. Distillates are items that are used to further increase the experience on your gear, so one of the perks of a patron subscription is you get to boost your gear up every day by a certain amount. This generosity also expands to the game’s varied dungeons, where your limited daily keys can be used in dungeon lootboxes to obtain even more distillates and junk gear to feed your inventory. I have very little reason to believe that my time in Secret World Legends will extend beyond completing the story, frankly I have neither the intent nor the willpower to continue the endless grind via repeating missions to continue leveling various weapons and equipment pieces. My character just hit level 50, and is about the venture into the relatively unknown lands of Transylvania. Even then, I’m feeling my interest waning in continuing on with the story after making the arduous journey essentially back to where I left off from the abandoned The Secret World. Verdict: 2.5/5 – Secret World Legends feels bad all around, from the enhanced combat system that doesn’t actually change much to forcing the existing community to either forgo their characters and in some instances purchases to start over or be left behind on the abandoned-yet-still-operating-until-Funcom-arbitrarily-kills-it-for-lack-of-players The Secret World, while ignoring issues that have been present in the game for years. It strips content from the original game, some for the better, while crippling other parts for the sake of the cash shop and loot boxes. While the missions are still engaging, gear progression is a mind-numbing snore and another function crippled for the sake of selling you lootboxes.